1) Swap white pasta for whole wheat pasta. By making this simple swap, you are trading processed, bleached flour for whole wheat pasta which contains fiber and protein – your “feel fuller longer” magical combo. 2) Pack in the veggies! Kale is one of my favorite super foods – not only because it is loaded in antioxidants but because it is sturdy and holds up to cooking. 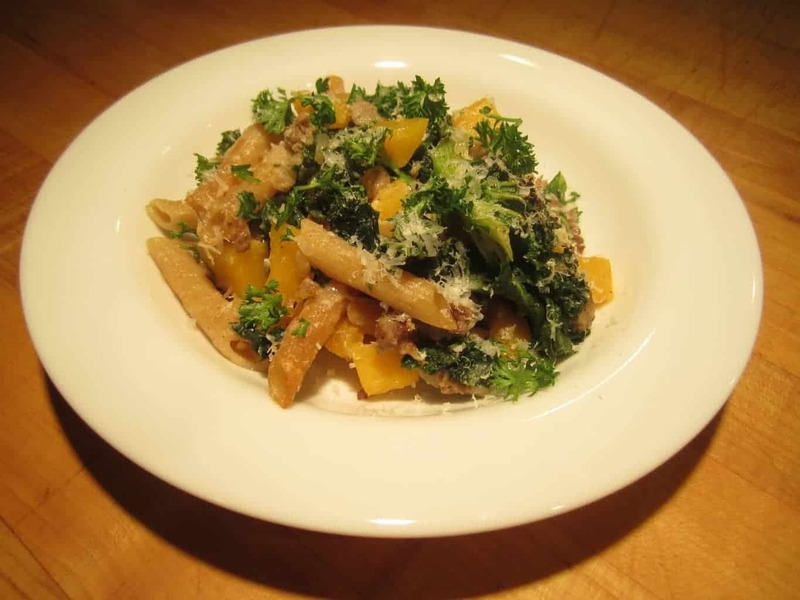 3) Butternut squash adds a creamy texture without the fat and calories of butter, cheese or whole milk. By incorporating this tender squash, you can use less butter and cheese. 4) Use good quality parmigiano reggiano. Give the stuff in the green bottle the night off and use the real deal. The real cheese is sharp and powerful which allows you to use less helping keep your calories and sodium in check. 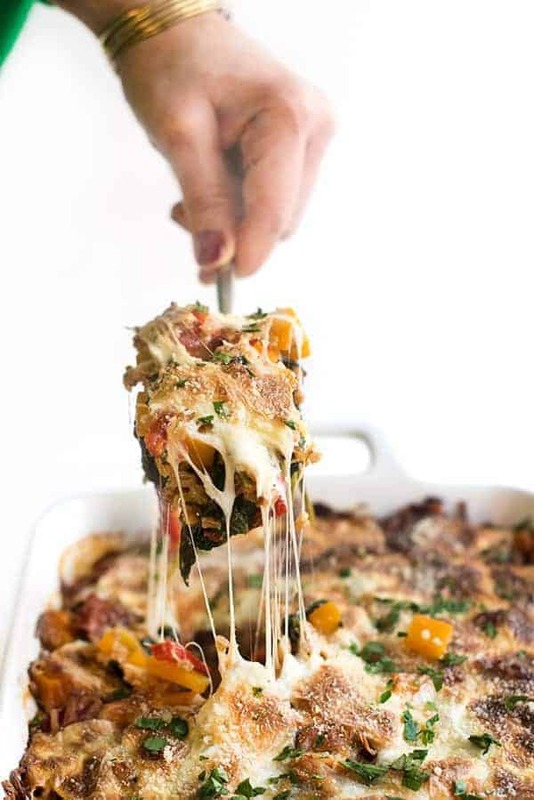 By making a few tweaks I was able to create a well rounded, nutrient-packed baked pasta that is sure to leave your tummy happy and full. Cook whole wheat pasta according to package instructions and set aside. In a deep sauce pan, saute diced onions over medium-high heat using non-stick cooking spray until tender. Remove sausage from casings and saute with onions and garlic using wooden spoon to break up the sausage. Continue cooking sausage until it is lightly brown. Add 1 c of water to pan and deglaze with wooden spoon before adding in butternut squash. Cook for 5 minutes or until butternut squash is mostly tender. Add kale and cook another 3-4 minutes until it starts to wilt. Add in cooked pasta, red pepper flakes, salt, pepper, milk and butter. Stir to combine and cook for another 2 minutes. Pour everything into a deep baking dish and sprinkle cheese evenly on top. Bake for 20 minutes or until bubbly. Excellent source of Vitamins A and C, good source of Iron and Calcium. 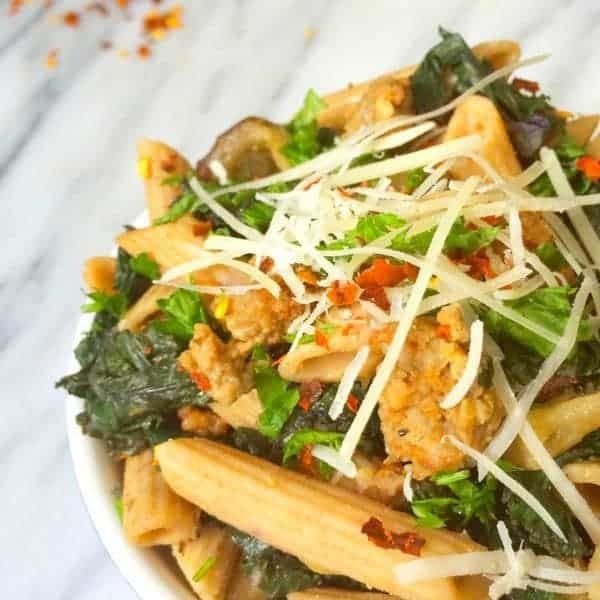 My sister has been talking about a pasta that her friend’s mom makes with kale, butternut squash and sausage… but since she’s 16 actually getting the recipe from her friend’s mom has proven near impossible. I typed the ingredients into Pinterest today and found your recipe, and I could not be happier with the results! I left out the garlic and onion because I didn’t have it handy, but even still this pasta was absolutely delicious! Can’t wait to have it again for lunch tomorrow, and looking forward to reading more of your blog in the future. Thanks! I have not made this, but it looks great! 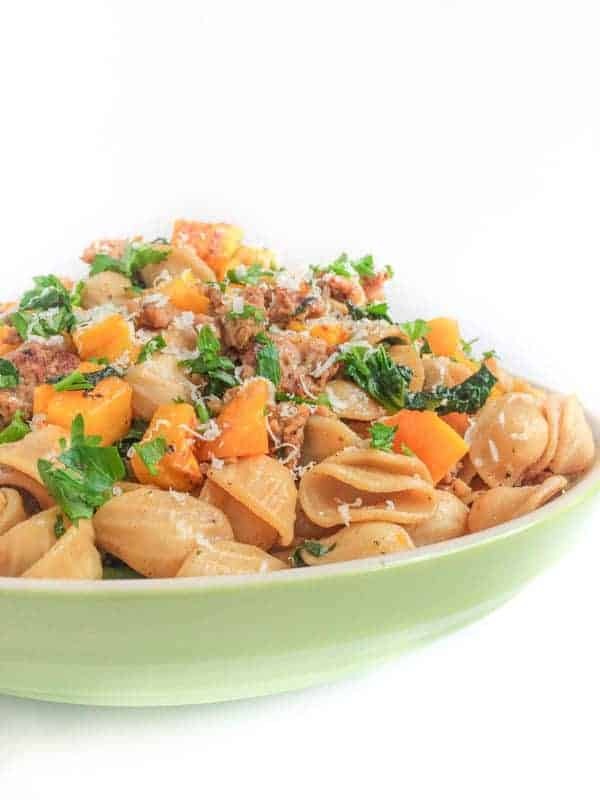 I am a big fan of sausage and kale soup, so I think the pasta and squash would be good too! I'm always looking for high-fiber, high-protein combinations to help fuel my runs and keep me eating healthy.